I’ve become increasingly convinced, training for my walking marathon in July, that the single most important and vulnerable bit of me is my feet. The 16-mile and 18-mile training walks have shown that pace, cardio fitness or stamina are not the problem – they’ve all been built up by running. Strength training is important, however I have learned that it’s the potential for foot injuries that could really scupper the whole project, during training or on the day itself. My problems have included severe heel blistering and Achilles tenosynovitis (fluid in the sheath around the Achilles tendon that leads to a characteristic creaking feeling when the foot is moved). The Achilles tendon is a troublesome beast, since once injured it becomes weakened, and ignoring or training through the injury can leave you with something so bad it requires surgery. It’s a bit late for a rethink on footwear – I don’t have the time (nor, to be honest, a spare hundred quid or more) to buy and break in a new pair of boots or hybrid boots/trainers. After first encountering problems I recalled that I’ve actually been wearing the same pair of slab-like Berghaus boots since the turn of the century, so the traumatic issue of replacing them will have to be tackled some time soon. But not now. I’m also loath to attempt it in my running shoes since, like an old banger, they now have more miles on them than is ideal and I’d rather wear them out altogether by running in them. Circumventing these problems has led to some real creative thinking recently and, by way of “technical” socks, alternative boot lacings and generous applications of what is euphemistically known as personal lubricant, I got through my 18-mile walk with relatively uninjured feet last weekend. But the aforementioned creative thinking has also seen me starting on a set of exercises designed to strengthen my feet and ankles (see the link at the bottom of this post). And, for this weekend’s planned 8-mile training walk, I decided to try a radical new direction. Since my boots were injuring my feet, and my feet and ankles were badly in need of toughening up, why not try to do at least a part of my hike barefoot? 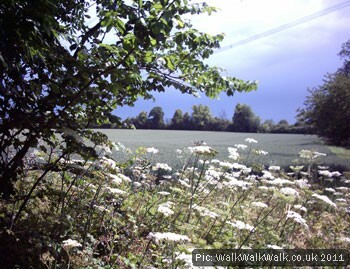 I’d chosen an out-and-back route designed to explore a local path that we don’t use very much – the Stevenage Outer Orbital Path, or STOOP. 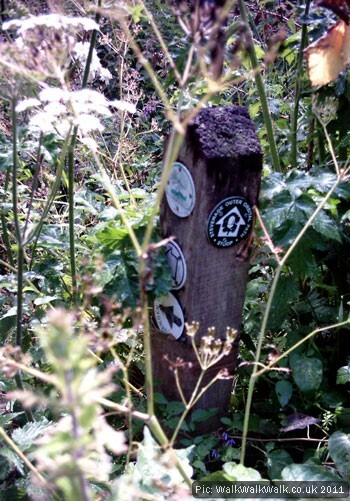 It’s very accessible at the point where it touches the south-eastern corner of Hitchin and also very well-waymarked on the ground – although finding a definitive route on a map has so far eluded us. The STOOP - very well-waymarked. I had decided to pick this up in Purwell and head out towards Great Wymondley and Ashwell Common – only to have the entire project nearly felled by an enormous shower of rain. Thus it was that I walked the first half-mile wearing walking sandals and no waterproof jacket, repeating unto myself: “La, la, la, I can’t see you,” while becoming increasingly wet, until the cavalry arrived in the shape of Beloved Other Half, in the car, with my coat, bless him. A nice grassy verge made the decision to shed the shoes relatively straightforward – until the point came to move onto the stony road used as a public path that made up the next section of the walk. It was actually easier than I would have imagined to avoid the stones but, gosh, mud is slippery. It took a good few yards and a turn-off onto a field-edge path before I could really decide what I thought about all this. And this is what I decided. 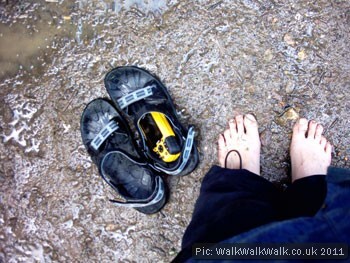 Barefoot walking introduces an entirely new sensory dimension into the hiking experience. You get an extraordinary amount of data through the soles of your feet – not least that the ground has temperature in addition to more easily deducible qualities like soft or sharp, wet or dry. Walking in warm mud is quite an experience, one you really ought to have in your walking lifetime. Splashing through the edges of puddles (it’s wise to avoid the centre no matter how you are travelling) becomes as entertaining as it was in childhood. This means that, so far, I would definitely agree with those people who argue that using minimalist footwear is not anything like the same as going barefoot because it deprives you of a crucial source of sensation – although I also wouldn’t personally leave home barefoot without some kind of lightweight back-up footwear in the backpack in order to guard against the unexpected. On the other hand, if mimimalist footwear gives you the confidence to walk or run barefoot at least some of the time – why not? I calculated afterwards that I managed between four and five miles of my eight-mile walk barefoot – the 1.5 miles around the turn-back point were shared with a cycle path and were really sharp and stony, and therefore unsuitable terrain for a barefoot beginner like me. In that time I experienced warm temperatures and both sunny and rainy conditions. A lovely sunny day in north Hertfordshire. I found out that being barefoot forces you to walk much, much slower than you would while wearing shoes and to concentrate much harder on the experience of walking, including the crucial activity of watching where you are putting your feet. 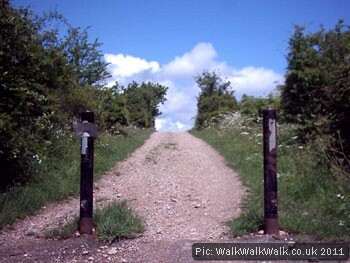 This act of thinking carefully about the process of walking has a close parallel in the Vipassana activity of walking meditation – see the links at the bottom of the page for a video of a leading practitioner performing it. 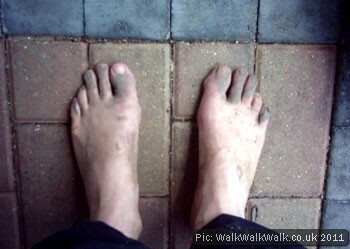 Anyone who has practised walking meditation should be right at home with barefoot hiking, and vice versa. The gait is also quite different. Marching along with straight back and legs, and bringing your foot down heel-first with a tremendous whack, as you would if wearing protective footwear, is out of the question. The resulting thud will echo right up your spine and reverberate around the top of your skull. Instead, the focus is much more on engaged hips (a concept that will be familiar to runners), slightly bent knees and the ball of the foot. As a result of this you progress much more quietly than usual and enjoy commensurately more wildlife-spotting opportunities. As for all the terrible things you fear you might find in the grass, well, I didn’t meet any of them. Top of my list of bugbears were items I imagine no would-be barefoot walker wants to encounter, and which might well put off many people from trying it at all. They are dog poo, broken glass or sharp metal, and anything dead. Thorns? There were a few, but when I found them I either took the weight immediately off the foot to stop them puncturing the skin, or simply pulled them out when they did penetrate, and kept walking. The most challenging surface that I found (and did not resort to shoes for) was a field-edge footpath covered in dried-out hedge-trimmings, hence the abovementioned thorns. My conclusion is that the things you imagine might be a problem are far less of a problem than you might imagine. When I arrived home, my feet felt great – easily as good as if they’d been professionally attended to in a nice, relaxing salon with coffee and magazines. My instinct was to give my feet (and indeed the rest of me) a really good soak in the bath to get them clean and flush out any nasties that may have got under the skin. I found a couple of small splinters that were the work of moments to remove, and which I guess might not even have bothered me if my feet had been tougher. A bit of that peppermint foot lotion from A Well-Known Retailer was the finishing touch in sorting them out. I did notice a different set of muscle aches and pains than usual. It was quite plain to me that I’d used different muscles walking barefoot than I generally do when using walking boots or running shoes. However this was complicated by the fact I’d used some unfamiliar gym equipment the night before so I can’t untangle the exact causes of each one. I do think I might have been using my lower back and core muscles more as well as different sets of muscles in the thighs and calves. Two things I noticed very strongly and they strike me as among the most interesting outcomes of the experiment. Firstly, the muscles in my feet and ankles feel actively fatigued in a way they never do when walking in footwear. I’m really pleased about this because it was really the purpose of the exercise. Secondly, even given the odd bruise and puncture (and there are a couple) my feet are in far better condition after walking barefoot than they generally are after wearing boots or shoes. I have no blisters, no inflammation, no Achilles problems, none of that terribly sore skin you get around callused areas of the sole, and none of that sense of the heel or the ball of the foot being bruised. Given the emphasis that we generally put on protective footwear for outdoor activities I find this extraordinary and, at first glance, counter-intuitive – although I am sure experienced barefoot running and walking advocates would feel it was quite the opposite. Now it is evening and there are one or two bruises or sore spots developing – but I cannot deny that my feet feel better than I would have thought possible having gone nearly five miles without extra support or protection and a further three-and-a-bit in walking sandals. To be honest, I’m not much of a shoe wearer at the best of times and my default position is generally to wander about barefoot whenever I can – or maybe wearing a warm pair of socks in cold weather. This means that the soles of my feet are already quite tough and I have an insouciant attitude to treading on rougher surfaces. Therefore going out into the big, wide world with no shoes on was probably not such a shock to my system as I expect it would be for some. In terms of my goal of improving the conditioning of my feet and ankles in preparation for a competitive event, I feel that this was a very successful experiment. It did not come without risk – if I had slipped and turned my ankle, or cut my foot badly, things would have got a bit messy. But, as stated above, approaching the whole experiment in a cautious and informed manner makes things like this that much less likely to happen. Now my feet and ankles have had an excellent workout as well as being toughened up – and I haven’t got any blisters or inflammation from this week’s activities. That’s a very valuable result indeed. As someone who also trains for long-distance running events I have already had a run-in with plantar fasciitis – an obnoxiously painful and debilitating condition caused by the inflammation of a great big band of tissue running under the foot. Luckily, for me it was a question of lengthening some shortened calf muscles, and once that had happened the problem cleared up. It is said that barefoot running can allow people chronically afflicted with this condition to enjoy their sport. While I don’t know to what extent this is true, I know that I’d certainly be willing to give it a try if I found myself with the problem again. However, I do feel that I would make the transition to barefoot running via minimalist footwear, since it otherwise involves changing so many variables at once, something that is never ideal. Next week’s 20-mile hike is the biggest weekend of preparation before the event itself and I suspect that boots will be all too necessary on that occasion. But I’m seriously tempted to return to the barefoot option for the shorter hikes and for the taper period. 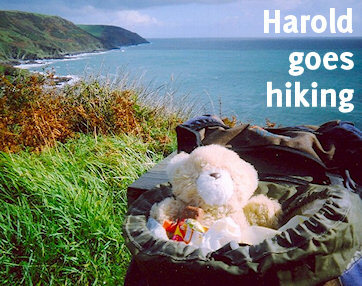 It was not only useful but also an amazing way to experience the great outdoors and one I would recommend to anyone who thinks they would enjoy it – as long as you approach it responsibly by assessing any potential risks and taking a few sensible steps to mitigate them. Ahcuah – a blog by the vastly-experienced barefoot hiker (and indeed barefoot liver) Bob Neinast, based close to Columbus, Ohio, USA. Runner’s World: Six exercises to build stronger feet and ankles – performed daily, these are an excellent basis for strengthening feet and ankles for the demands of walking and running, barefoot or shod. YouTube: Walking meditation with Thich Nhat Hanh – The highly-regarded Buddhist monk demonstrates the Vipassana technique of mindful walking – which is essential if you’re planning to go without shoes. Coach Jenny Hadfield on barefoot running – her approach advocates gradually strengthening the feet and ankles as you add barefoot elements to your exercise routine. Categorised under Races and challenges, Tips and advice, tagged under barefoot hiking, barefoot walking, Fairlands Valley Challenge, marathon walking, Stevenage Outer Orbital Path, STOOP.